One of the sessions I attended at last year’s CETIS get together was the UKOLN organised Technological Innovation in a World of Web APIs session (see also My CETIS 2008 Presentations and What Makes A Good API? Doing The Research Using Twitter). The ‘Good APIs’ project aims to provide JISC and the sector with information and advice on best practice which should be adopted when developing and consuming APIs. In order to collate information the project team have written a very brief research survey asking you about your use of APIs (both providing and consuming). TAKE THE What makes a good API? SURVEY. PS here’s another fun looking event – Newcastle Maker Faire. A few days ago, I posted a few observations about internet appliances, leaving the post dangling with a comment about how nice it would be to have an internet TV applicance that was as easy to use as the Pure Evoke Flow wifi radio. Well, it seems that CES will flush a few first generation candidates out of the woodwork – like the LG/Netflix streaming broadband TV, for example. Sony also do wifi TVs, such as the Bravia ZX1 for example, but I’m not sure if this can stream video content from the web directly? 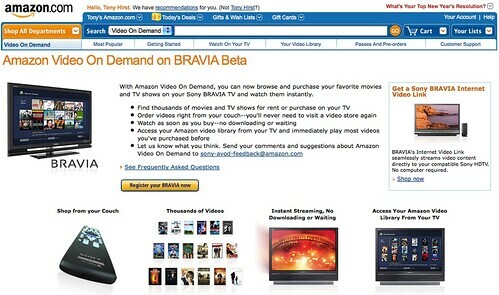 Using the BRAVIA Internet Video Link Module, however, it is possible to stream content from the web to Bravia TVs, as this landing page for the Amazon Video On Demand on BRAVIA Beta suggests. 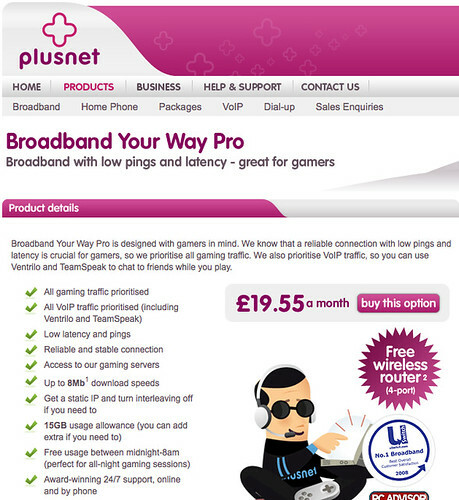 So here’s where my one “prediction” for the year ahead comes in to play: we’ll start seeing adverts for broadband connections that both raise and play upon people’s awareness that broadband is not just for computers (because not everyone feels the need to have a networked computer), but it’s also a desirable for an increasing range of home/consumer electronics appliances. Hmm – does that mean my prediction has already come true? Or does it mean that the rest of the world (but not me) knows this is how the world already works just anyway? All Set for a Year of Internet Appliances? As JC pointed out in his post, gadgets like the Evoke Flow could indeed be a game changer. 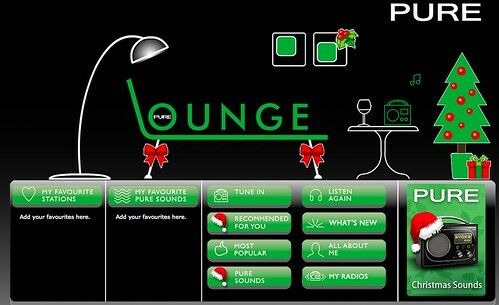 On Christmas Day, we were wifi-less, which meant that the first experience of the radio was as a DAB radio. A quick self-tune on start-up, and a good selection of DAB channels were available. Getting back home meant we could get the wifi channels too – configuring the radio with a wifi key went smoothly enough, and getting an account with the online Lounge service provided a key to register the radio with lots of online goodness. Wifi radio channels can be favourited online, along with podcast subscriptions, and stored in separate folders; the favourites are then also available on the radio itself. Radio stations can also be browsed and favourited on the radio itself – favouriting them also adds them to a particular folder in your online account. within a few minutes of being connected for the first time, the appliance found a software update and offered to install it – a process which was achieved quickly and efficiently; in an age where automatic software updates are increasingly possible, what does this mean for built-in/planned obsolence? the integration between the appliance itself and the online account means that the radio has a full web browser interface and management tools, if required. 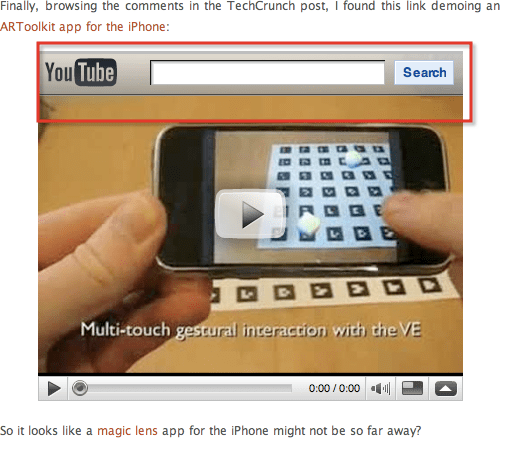 (I’d quite like an iPhone interface too;-) I’ve written about “dual view” working before (Dual View Media Channels) – here’s an example of it in action with an interface for one device being provided through another. the appliance makes good use of soft/programmable buttons – a bit like a mobile phone, the functionality of the “buttons” is context dependent; the “undo” (or “go back” a step) button is incredibly useful, too. I haven’t tried streaming music to the appliance from another computer, but that facility is also available. From even just a couple of days playing with the Pure Evoke Flow, I’m sold on it – and the idea of streaming, dedicated internet appliances in general. So the idea of the BBC/ITV set-top box – Project Canvas – really appeals… (e.g. Canvas and the connected home and Partners to bring broadband to the TV; looking forward, this is also relevant: IMDA – Internet Media Device Alliance, a trade alliance for agreeing on protocols and formats for streaming digital media). 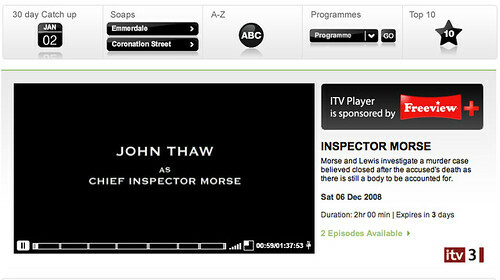 So if, as with me, the announcement passed you by, here’s a catch-up: in early December, 2008, ITV rebranded its online catchup TV service as ITV Player. Unlike the Adobe Flash’n’Air approach taken for the BBC iPlayer, ITV and Sky have both opted for Microsoft’s Silverlight (as described in ITV’s case here: Silverlight on the ITV Player). 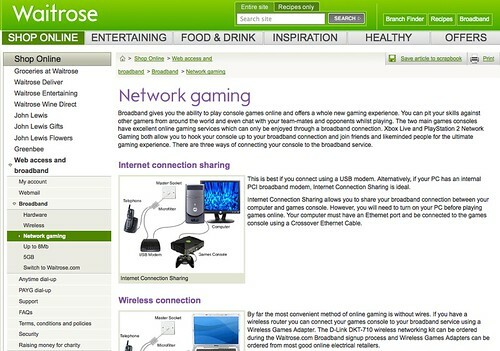 Author Tony HirstPosted on January 2, 2009 January 5, 2009 Categories Anything you want, BBCTags digital appliance, inernet appliance, Pure Evoke Flow, wifi radio4 Comments on All Set for a Year of Internet Appliances? In 2004, Tesco launched an in-store video service under the name Tesco TV as part of its Digital Retail Network service. The original service is described in TESCO taps into the power of satellite broadband to create a state-of-the-art “Digital Retail Network” and is well worth a read. A satellite delivery service provided “news and entertainment, as well as promotional information on both TESCO’s own products and suppliers’ branded products” that was displayed on video screens around the store. Up to eight different channels are available on TESCO TV, each channel specifically intended for a particular zone of the store. The screens in the Counters area, for instance, display different content from the screens in the Wines and Spirits area. The latest music videos are shown in the Home Entertainment department and Health & Beauty has its own channel, too. In the Cafe, customers can relax watching the latest news, sports clips, and other entertainment programs. Remote control from a central location of which content is played on each screen, at each store, in each zone, is an absolute necessity. One reason is that advertisers are only obligated to pay for their advertisements if they are shown in the contracted zones and at the contracted times. In parallel to the large multimedia files, smaller files with the scripts and programming information are sent to all branches simultaneously or separately, depending on what is required. These scripts are available per channel and define which content is played on which screen at which time. Of course, it is possible to make real-time changes to the schedule enabling TESCO to react within minutes, if required. On a related note, it’s not just Tesco that use video screen advertising, of course. In Video, Video, Everywhere…, for example, I described how video advertising has now started appearing throughout the London Underground network. So with the growth of video advertising, it’s maybe not so surprising that Joel Hopwood, one of the management team behind Tesco Screens Retail Media Group should strike out with a start-up: Capture Marketing. [Capture Marketing] may well be the first agency in the UK to specialise in planning, buying and optimising Retail Media across all retailers – independent of any retailer or media owner!! So what’s the PR strapline for Capture Marketing? “Turning insight into influence”. If you step back and look at our marketing mix across most of the major brands, it’s clearly shifting, and it’s shifting to in-store, to the internet and to trial activity. So what’s the answer? Marketing to shoppers. We’ll help you get your message to the consumer when they’re in that crucial zone, after they’ve become a shopper, but before they’ve made a choice. We’ll help you take your campaign not just outside the home, but into the store. Using a wide range of media vehicles, from digital screens to web favourite interrupts to targeted coupons, retail media is immediate, proximate, effective and measurable. I have no idea where any of this is going… Do you? 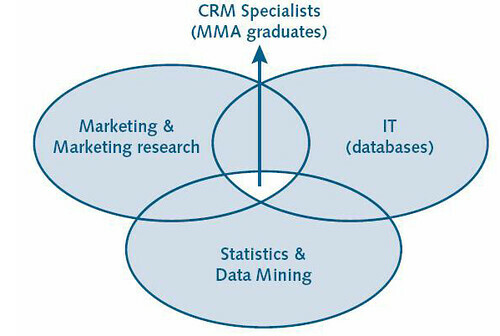 Could it shift towards making use of VRM (“vendor relationship management”) content, in which customers are able to call up content they desire to help they make a purchase decision (such as price, quality, or nutrition information comparisons?). After all, scanner apps are already starting to appear on Android phones (e.g. ShopSavvy) and the iPhone (Snappr), not to mention the ability to recognise books from their cover or music from the sound of it (The Future of Search is Already Here). PPS for a quick A-Z of all you need to know to start bluffing about video based advertising, see Billboards and Beyond: The A-Z of Digital Screens. So What Do You Think You’re Doing, Sonny? A tweet from @benjamindyer alerted me to a trial being run in Portsmouth where “behavioural analytics” are being deployed on the city’s CCTV footage in order to “alert a CCTV operator to a potential crime in the making” (Portsmouth gets crime-predicting CCTV). 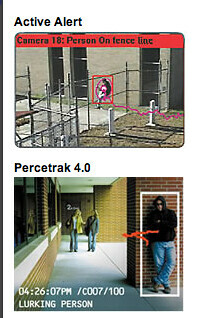 I have to say this reminded me a little, in equal measures, of Phillip Kerr’s A Philosophical Investigation, and the film Minority Report, both of which explore, in different ways, the idea of “precrime”, or at least, the likelihood of a crime occurring, although I suspect the behavioural video analysis still has some way to go before it is reliable…! When I chased the “crime predicting CCTV” story a little, it took me to Smart CCTV, the company behind the system being used in Portsmouth. And seeing those screenshots, I wondered – wouldn’t this make for a brilliant bit of digital storytelling, in which the story is a machine interpretation of life going on, presented via a series of automatically generated, behavioural analysis subtitles, as we follow an unlikely suspect via the CCTV network? See also: CCTV hacked by video artists, Red Road, Video Number Plate Recognition (VNPR) systems, etc. etc. PS if you live in Portsmouth, you might as well give up on the idea of privacy. For example, add in a bit of Path Intelligence, “the only automated measurement technology that can continuously monitor the path that your shoppers or passengers take” which is (or at least, was) running in Portsmouth’s Gunwharf Quays shopping area (Shops track customers via mobile phone), and, err, erm… who knows?! Author Tony HirstPosted on December 2, 2008 November 30, 2008 Categories Analytics, Anything you wantTags privacy2 Comments on So What Do You Think You’re Doing, Sonny?